Note: Universal FX is out of business. The company website is closed. 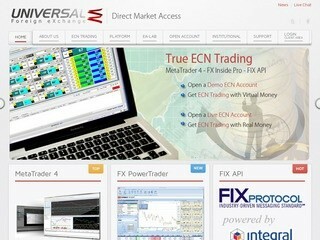 Note: Universal FX is a white label partner of SwissQuote Bank. Broker Status white label partner of SwissQuote Bank. December 19, 2013: The site is no longer online. Move to closed listing. July 15, 2012: Add a listing for Universal FX .